Photo: "It took too long to get permission"
The latest Croatia Holiday and Home Newsletter has some interesting information in it. The Croatian government have apparently passed new laws to speed up the process of foreign property buyers receiving permission to own a property as foreigners. At the moment it can take up to three years. It appears that the Ministry of Foreign Affairs are sending back all the 5600 applications, currently log jammed in the system, to The Ministry of Justice, who plan to start a new department within the ministry to deal with those applications some time in September. We’ll have to see if the new system works better than the old one. And remember, if you don't want to join the property buyers queue, you can always set up a Croatian company to purchase the property but you need to be aware of the complications that come with that option. Croatia Airlines – we’ve found them to be best value this month for short notice flights between Split and London but if you can be flexible it helps. Easyjet – flights to Rijeka from Bristol and Luton and to Split from Gatwick. Very little in the way of bargains to be had at short notice for the summer. And of course there are plenty of charter operators vying for business as well though we've just read of a Scottish charter company who has had to merge their twice weekly flights into one, apparently because there's a shortage of accomodation in Croatia - hard to believe with all the new holiday apartments springing up but credible in terms of hotel accomodation where good family hotels are in short supply. There's more good news in the autumn if you're travelling to the North of Croatia as Ryanair have just anounced that they will be flying from Stansted to Pula from 31st October - www.ryanair.com. Jadrolinija – the state owned Croatian ferry line will get you to most places on the mainland and the islands and does its best to lay on extra ferries in the high season but, if you’re taking a car on board, its wise to turn up fairly early for your departure. The new motorway makes the journey along the coast a lot quicker but be prepared for jams on the peak weekends. The alternative is the coast road which is single lane nearly all the way with plenty of bends in some stretches making overtaking difficult. And of courses there’s this site, Croatia Online, for all the useful inside information and tips that you would expect from a website that’s written by someone who’s explored and lived in Croatia for 4 years. Below are quick links to some of the best pages for holiday makers if you don’t have time to browse through the site, though there are plenty more. Croatia - Which Destination and When? Enjoy your travels and your holiday. 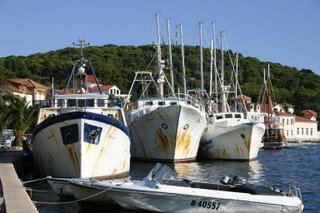 Croatia Lifestyle - Fresh Croatian Fish? We've speculated for some time on whether much of the fish we eat in Croatia really is the class one, locally caught, catch of the day or comes from some other source. We've not spotted much fish of any decent size in our travels by boat around the Adriatic but we've seen plenty of fishing boats, apparently unused for long periods, and many run down villages that once used to thrive on the fishing industry. In an article in yesterday's New York Times, Elisabeth Rosenthal reports from Sucuraj on Hvar Island and suggests that much of the fish we eat in Croatia is imported from as far away as America. The Bluefin Tuna, once abundant in the Croatian Adriatic, is now rare in the wild, but caught elsewhere and fattened in farms here. The article is essential reading but paints a depressing picture of overfishing and depleted stocks. Go to http://www.nytimes.com/2006/07/16/world/europe/16tuna.html for the full story. You'll have to register to read it but it's free. Croatia Lifestyle - Getting a Haircut! Croatia abounds with “Frizerski Salons” where ladies can get the trendiest of cuts, if that’s what they want, for less than a tenner. That includes shampoo and conditioner, mouse, styling gel, etc. Chaps will probably have to part with no more than a fiver. Our experience is that all established hairdressers are highly skilled and professional and most speak English. Moreover they don’t seem to want to convince you into a style they want to cut, but are happy to let you dictate the shape, the length and anything else that’s important to you. Most Croatian ladies hair stylists have the latest of products and accessories which means that if you feel like a change of colour, or need a perm or a set, that’s no problem too. In general, salons seem to operate on a “walk in” policy with few clients making appointments. If it's busy when you get there, they'll tell you how long you've got for a coffee or shopping before you come back. The quietest time seems to be between about 1 and 4 when the locals are having lunch and a siesta. There are bound to be some novices around, like anywhere else, so get a recommendation from your landlady or the best coiffed waitress in your local restaurant. 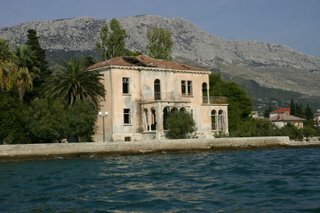 If you’re anywhere near Trogir, try Frizerski Salon Stil, telephone 021 884 225, on the Riva, about 50 yards from the bridge end. All the stylists (for men and woman) speak good English and its popular with locals and visitors alike. Regular readers will have noticed that Dalmatia gets a lot of coverage on Croatia on line. Dalmatians might argue that Dalmatia IS Croatia but, in the interests of unbiased editorial independence and balanced geographical coverage, we asked Peter Ellis to give us his insight on Istria, Zagreb and other northern Croatian delights, together with some essential facts if you are contemplating buying a property in Croatia. Peter's company, Croatia Property Services, is based in Istria and is long established in the Croatian property market. Check out the website or contact Peter via the website for more information. Many thanks to him for allowing us to reproduce the article and photo and for helping us to get a real taste of Istria. For some time now Croatia has been top of everyone's wish list for the place to invest in a holiday home abroad. Sophisticated, warm, friendly and most importantly, not far away, Croatia has rightly established itself in buyers' minds as the place to be. Ralf Schumacher is just one of many celebrities who have bought here and Madonna, Princess Stephanie of Monaco and the Sultan of Brunei have all holidayed here in the last two years. Articles in magazines can set the scene, but what is it really like to live here? I first visited Croatia four years ago, en route to the Graz Opera Ball, where I met my wife, a Croatian property lawyer. For someone who had travelled widely, it is perhaps surprising that I had never been here before. My first sight was of the glorious Zagreb architecture on coming out of the restored Austro-Hungarian railway station. Despite two world wars and the recent war of independence, Zagreb still has its medieval and magnificent imperial 19th century architecture intact. It is a time capsule. The old upper city, Gornje Grad, where we subsequently bought and rebuilt an 18th century apartment, still has gas lamps and lamplighters, although on a more modern note, we also have broadband internet connections and on the next hill we even have Marks & Spencer’s and a multi-screen cinema in a modern shopping complex. Zagreb is a city full of art galleries and museums, where pavement cafes offer great coffee for under a pound and hot chocolate you can stand a spoon up in. The strong cultural scene spans everything from opera to international rock concerts, Alan Ayckbourne to ‘Chicago’. For me, Croatia combines the best of the old with the conveniences of modern living. It combines traditional politeness, where strangers greet each other in the street and wish each other Happy New Year or Happy Easter, with modern facilities. It combines a country where, if I forget to lock my car, it is no big deal, with an ability to pay for city parking using a mobile phone signal. It is a country where not only does the health service function, it doesn’t cost an arm and a leg to go to the dentist. Croatia isn’t just Zagreb, though. It is probably best known for its amazing coastline, dotted with thousands of islands, many uninhabited and a yachtsman’s dream, with dozens of marinas and a cheaper place to winter a boat than France, Italy or Spain. Dubrovnik, at the southern end, protected by UNESCO, is a complete walled medieval city that attracts thousands every year with an elaborate cultural programme and is a regular stop for the big cruise boats. At the northern end there is Istria, the ‘New Tuscany’, known to the local inhabitants as Istra Magicka, a land of wooded hills and vineyards, with medieval stone towns perched improbably on the hilltops, and superb local food and wine. In Istria, there is a natural sequence of local produce that starts around Easter with wild asparagus, continuing through early summer with black truffles, cherries, then apples, plums, apricots, peaches, figs and grapes, until the nuts start and the white truffles are ready. The wines come from small producers: the Degrassi Cabernet Franc, the Kozlavic Muskat, the Poletti Malvazia and the Arman Teran are all superb. The acacia honey comes from numerous producers, of whom Jankovic at Livade is particularly good. The fish is fresh from the little boats the night before. Local restaurants don’t seem to know what frozen fish is. Then there is prsut, similar to the Italian prosciutto, made in small batches by farmers’ wives, sold carved from the bone, and venison. Vegetables are fresh, organic even, produced in the traditional way with natural fertilizers, without lots of pesticides. Every Sunday, the border posts are full of Italians coming for Sunday lunch, getting traditional quality at prices unknown in Italy and taking Istrian specialities home with them. Butterflies and dragonflies abound and the air is alive with the sound of bees and grasshoppers. Every time I go from Zagreb across to Istria and emerge from Ucka tunnel to see the amazing vista unfold, I remind myself that I could be stuck in traffic jams in Shepherds Bush twice a day. Living and working in Istria is like winning the lottery. Of course it also has coastal resorts, marinas and the clearest water imaginable. Sitting at a café at Novigrad, listening to the water lapping against the quayside while the sun goes down, makes a hard day’s work very worthwhile. If the whole lifestyle grabs you, what next? If you are British or Irish, the process for buying is relatively straightforward, if bureaucratic, but that is what you pay your lawyer for. Before putting any money down, get the title checked. Even newly built property can still have problems if the builder has deviated from his planning permission so it is essential to have everything checked first. All too many agents will assure you that the papers are correct when they are defective. Once you are certain, the usual process involves a Pre-Contract, closely tying a deposit of typically 10% to the property while you get your main funds together, with a full Contract following at a mutually agreed date. If the property is still being constructed, this may involve stage payments. Otherwise this is usually about three weeks later, although if you have money on term deposits or if you need longer to obtain equity from a building society on an existing property, discuss this with the vendor’s agent, as it is important to ensure that the contract date is attainable. If you cannot come up with the funds on the agreed date, you run the risk of forfeiting your deposit. At least if the vendors pull out, they must pay you double the deposit, which deters gazumping. It is common with new property to include a small retention, whilst the builder obtains a Usage Certificate, as this can only be applied for once the property has been completed. As soon as the final payment has been made, you will be able to occupy and use the property, although there will be a delay while your lawyer applies for the acknowledgment of reciprocity from the Ministry of Justice (until recently the Ministry of Foreign Affairs) that is a prerequisite for getting your name in the Land Registry. If you need to register the property quickly, or if you are from a country that does not offer reciprocity to Croatians wanting to buy property, the alternative is to form a Croatian company and use this to buy the property. It may also be essential if part of the property is not in the building zone, as foreigners cannot otherwise own agricultural land. It is possible to do a Pre-Contract in your own name, while you form the company and clause it so that the Final Contract will be in the new company name. This may be useful if there are other buyers and the vendors are unwilling to wait. 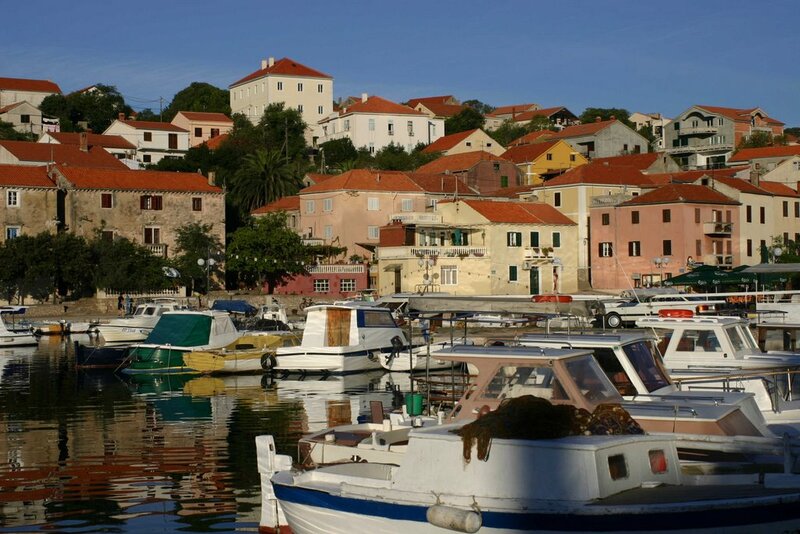 Apartments in tourist areas are always in demand and in places like Novigrad, where a new marina is currently being constructed, they will be readily lettable. Much has been written about Dubrovnik but prices there are now so high that the ratio between costs and earnings is not as good as up in Istria. Accessibility, particularly with availability of low cost airlines is important, both for buyers and anyone they may wish to rent to. Prices start around £60,000, with good two bedroomed ones around £75,000. Prices locally are usually quoted in Euros. Places like Bulgaria may offer ultra cheap apartments, but if they are difficult, time consuming or expensive to fly to, neither you nor your clients will want to visit very often. Novigrad is in Istria and the current boom in Istria is being fuelled by Ryanair flights into Trieste that are only an hour away. Even the Easyjet flights in to Ljublijana are only 90mins away and now we have them in to Rijeka, too, only an hour away. That is on top of flights direct from Heathrow to Pula and Rijeka in the summer. Flight times are around two hours, significantly less than flights to Greece, Turkey or Bulgaria. For buyers looking for something more luxurious, the other popular type of property is a stone house. Restoring an old one is very time consuming and even at low Croatian labour rates can prove expensive in the long run. A better bet are the ones being built to traditional designs with reclaimed stone by local firms that offer all the magic of an old stone house with modern plumbing, electrical wiring and insulation. They sell even before they are completed, such is their popularity. At prices from £200,000, including a pool, they offer good rental potential and with the price per square metre comparable to that of an apartment they offer excellent value. Their scarcity also means that they are likely to exceed the current capital appreciation of around 20% per annum that property in general is enjoying in Istria. If Croatia follows the same trend that other countries like Hungary, the Czech Republic and Slovenia had immediately prior to joining the EU, this is likely to rise sharply, as Croatia is online for joining the EU in 2009. In short, this is a good place to invest in, with the bonus that it is a truly lovely place to live in and where increasing numbers of people are buying with a view to eventually retiring to. At last there’s somewhere to go for the real English breakfast that you’ve been missing since you came to Croatia, and a lot more. 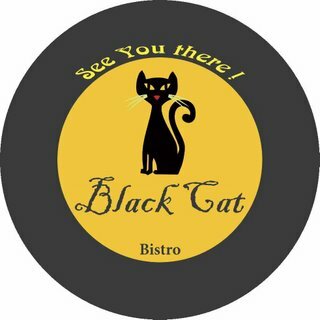 Tucked away in the bustling back streets of Split, just a five minute walk from Split Riva, and a similar distance from the ferry terminal, is the newly opened Bistro Black Cat. Sit on the cool shaded terrace and enjoy Eggs Benedict, sausages and bacon, or filled croissants for breakfast, a varied and beautifully presented selection of the freshest produce available for lunch, Happy Hour between 5pm and 6pm, and evening Tapas. The menu is inspired by Marina, the co-owner, and brings together the best of what she has learned in her extensive travels around the world, some of it meeting the high gastronomic demands of superyacht owners and guests. Fortunately she has managed to do so at an affordable price which makes Bistro Black Cat a haven for back packers and gourmets alike. The by-line is simply “Great Food”, and there’s plenty of it. Though the restaurant has an international flavour, it’s good value for money and popular with locals, visitors and ex-pats. You’ll find Bistro Black Cat, on the corner of Petrova and Šegvićeva, by walking east to the end of Split Riva, passing the market on your left, and then over the bridge over the railway lines on to Petrova. You’ll quickly come to Šegvićeva on your right and the welcoming sign of “Bistro Black Cat”. Or phone 021 490 284 for directions if you get lost! Open 8 am to 12 pm. Find a berth for your boat in Croatia - though prices are increasing steadily, they started from a low base, so berthing your boat in Croatia is still a good option compared to other Mediterranean destinations. Where else in Europe can you explore over 1000 islands, swim in crystal clear waters and explore villages untouched by time? Vis Island – Vis used to be a military stronghold and was one of the last areas opened up to visitors after the Second World War so it’s remained undeveloped and unspoilt. A great place to visit. Boat Shows in Croatia – Growing fast from small beginnings, is this the excuse that you need for an out of season break? Sibenik - A Sleeping Croatian Beauty – Off the tourist map, as yet, Sibenik is waiting to be discovered. The industrial suburbs hide a city centre with a real heart and the nearby islands are waiting to be explored. Property News in Croatia – It’s not the snip it once was and you could be stung if you don’t tread carefully but there are still bargains to be had. Eating Out in Croatia – Don’t expect too much in the way of fancy sauces, but if you like plain fresh grilled fish and meat, and fruit and vegetables that taste like they used too before EU standardisation, Croatia is the place for you. Traditional Croatian multi harmony singing – Klapa Music is a Croatian speciality not to be missed. Bosnia - Gems Just a Short Drive From Split – Livno and Kupres are only a two and four hour drive from Split respectively and well worth a visit. Retail Therapy in Croatia – What to expect from the Croatian Shopping Experience. Renting a Holiday Apartment in Croatia – New apartments are multiplying like rabbits. Here’s how to get the best deal. 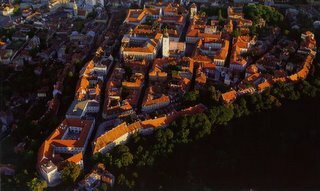 Zagreb – The inland capital is a great place for an off season break. Croatian Beaches – The hidden, the sandy, the best ones for wind surfing and remember, in Dalmatia, you’re mostly never very far from one. Brac Island – One of the easiest islands to get too and full of varied treasures. 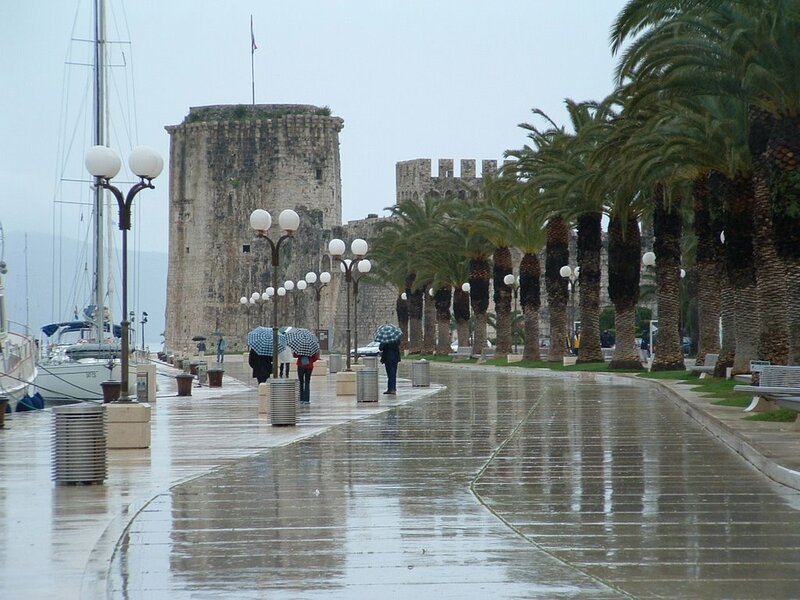 Trogir – if you want to stay in one place for a while, and experience the widest variety of the best that Croatia has to offer, then Unesco protected Trogir is the perfect base. Wherever you go and whatever you do, enjoy Croatia while it's still a humble rising star and watch this space for the inside track on what's really happening, as it happens. It may be non pc to write about the joys of smoking in Croatia when all around are banning it in every conceivable “public” place, but Croatia’s attitude to smoking exemplifies many aspects of life here. 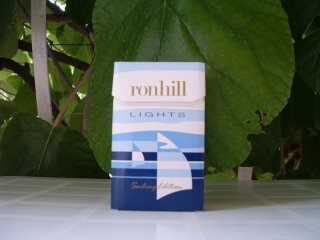 This article was inspired by the new “sailing edition” of one of the local brands, Ronhill Lights. As you can see in the photo, the design on the pack is worthy of a multi million pound British Airways rebranding project and might yet feature on the tail of their planes for the summer season! What’s the message? Well, of course, sailing and smoking go together like nautical tourism and ecological damage! Yes, it’s a dangerous habit, and Croatia only publishes health warnings on the packs in small letters, and no where near as terrifying as the messages on European produced cigarettes, but thankfully Croatia is far from becoming a nanny state. It leaves individuals to decide what to do with their money and their health within a basic legislative framework that, in this case, is remarkably free from the bureaucracy found elsewhere. If you want to smoke, it will cost you about £1.50 a packet and you can do so almost anywhere, virtually guilt free. No doubt this will all change as EU entry approaches but for smokers feeling persecuted elsewhere in the world, Croatia, relatively speaking, is a smoker’s paradise. Evangelical non smokers should not however despair or let this put them off a Croatian holiday. You’ll be eating, drinking and swimming out of doors and there’s plenty of fresh air to go round. Regular readers will no doubt be a little disappointed with the absence of any new postings since May, for which we apologise. Postings will continue to be sporadic for the next couple of months or so whilst Croatia Online’s Editor and her co-writer, John Nash, complete their long awaited Cruising Companion on the Dalmatian Coast. It’s been two years in the research and writing but all the chapters have now been drafted and so it’s down to selecting the photos, getting the charts done, editing and updating the earlier chapters and adding the finishing touches. It’s been a huge project, much bigger than originally anticipated by the publishers, but hopefully will prove well worth all the effort. Modesty aside, earlier guides suffer from having being ahead of their time when they were first published and, even with regular revisions, they can’t hope to keep abreast of the rapid pace of change in Croatia from long distance, or via periodic visits. So it should be, by far, the most up to date cruising guide of its kind in the bookshops, and is the only one, as far as we know, that has comprehensive contact details of onshore facilities – nautical, gastronomic and recreational – as well as the standard cruising information. The final editing and printing process obviously takes some time, so it won’t be out until towards the end of this year, but watch this space for news. As regular readers will be aware, we assisted Time Out with marketing and editorial for their two new publications, Croatia for Visitors Magazine and Time Out Croatia, the definitive and most up to date guide book on Croatia . The magazine is on sale internationally until the Autumn and is a very good read, as well as containing a host of information on what to do and where to go in Croatia. All the basic listings are there together with a host of features on issues such as buying a property, Croatian gastronomy, beaches, rural tourism and current affairs. The Guide Book has one of the best summaries of history and current affairs that we’ve seen, and the inside story on what’s really happening in contemporary Croatia – a breath of fresh air compared with other similar publications as well as being bang up to date on where to stay, what to see, the best restaurants, etc. Working with Time Out has been one of the most refreshing experiences we’ve had since coming to Croatia nearly four years ago and it’s great to see enlightened Croatian organisations taking advantage of the opportunities that Time Out offers to reach an affluent international audience. A special thanks to the following companies for having the courage and foresight to participate in the first Croatian editions, the acumen to recognise the power of Time Out and for being great organisations to do business with. We’ll be featuring each and every one of them in Croatia Online just as soon as the Cruising Companion has gone off to the printers!